A textual and contextual analysis of the song cycle Die schöne Müllerin, Op. 25, D 795, text by Wilhelm Müller and music by Franz Schubert. Müller's poems were published in 1820 and Schubert set them to music some time between autumn 1823 and spring 1824. A textual and contextual analysis of the poems of Die Winterreise by Wilhelm Müller, music by Franz Schubert (Winterreise, Op. 89, D 911). Müller's poems were published in 1823 and Schubert set them to music in 1827. In the Schubert song Die Forelle the bright rustic idyll of the first two verses darkens when, by a subterfuge, the angler catches the fish – a dark event which hints at a much darker event in real life. This article is a study of the circumstances surrounding the creation of the poem by the musician, writer and journalist Christian Friedrich Daniel Schubart around 1782, during his ten year incarceration in the fortress of Hohenasperg at the arbitrary decree of Carl Eugen, Duke of Württemberg. In 1792 Friedrich von Matthisson wrote a poem Andenken, 'Remembrance'. It was first printed ten years later in 1802 and Franz Schubert set it to music in April 1814 (D 99). In the year Matthisson wrote the poem, his friend Friederike Brun wrote her own variation on it, which she titled Ich denke dein, 'I think of you'. Then, in the spring of 1795, Johann Wolfgang von Goethe was inspired by a musical setting of Brun's poem to compose his own lyric to that music. He titled it Nähe des Geliebten, 'The proximity of the loved one'. In February 1815 Schubert set Goethe's version to music (D 162), giving us an example of what happens when two geniuses collaborate. In the course of two generations, Schubert's ancestors moved from the world of feudal peasants living in a distant province of the Holy Roman Empire to the life of a musical genius in its capital, Vienna. Each of those two generations – the composer's grandparents and then his parents – took a gigantic step in raising the family out of its agricultural anonymity into the metropolitan culture of the capital. The text and context of Franz Schubert's setting of Gretchen am Spinnrade, Op. 2, D 118, composed in October 1814. Goethe's Faust, Mephistopheles and their pact; Gretchen overheard in the tempest of demonic passion that will ultimately ruin her. Emperor Franz II/I, 24 years old at his accession to the throne of the Holy Roman Empire in March 1792, reacted quickly to the dangers that faced him. The French Revolution of 1789 would not to be repeated in his territory. In these dangerous, combustible times he needed calm, he needed security; he needed police and he needed censors. Artistic life in Austria existed under a belljar of his repressive measures that directly affected Schubert and his circle. In Die schöne Müllerin, one of the most charming and well-executed poems is undoubtably Wohin? It is the first appearance of the stream that will lead the wandering miller to his mill and to his girl and – always the good listener – will accompany him to the bitter end. The rustling stream has its inspiration in the epochal 'rustic' anthology Des Knaben Wunderhorn (1808). Schubert fans know of Joseph and Anton von Spaun as early and prominent members of the Freundeskreise, the 'Circles of Friends' around Schubert. Both were respectable and loyal friends who supported the young composer in many ways. Their father Franz Xaver von Spaun was an upstanding member of society in the Austrian town of Linz. In contrast, their uncle, Franz Seraph, was a bloody-minded malcontent whose life was a trail of wreckage. This is his story. An account of the failed Jacobin revolution in Austria and Hungary, its ruthless suppression and its legacy of half a century of political fear and repression. In the Vienna of this period, making music was the safest thing to do. When Schubert's life ended, on 19 November 1828, he was 31 years old. What had the trajectory of that life been? What would he have seen had he been able to turn around and look impartially at that trajectory? Franz von Schober is an extremely important figure for Schubert scholarship. During the second half of Schubert's life he was probably the composer's closest friend. Schober's life and his relationship with the composer and his other friends is a tangled ball of knotty puzzles. At moments he is revered, at other moments reviled. The Schubert family, seen through its 'Family Chronicle', particularly as it involves Schubert's relationships to his siblings and his step-siblings. What did Franz Schubert look like? Hits, misses and outright errors in his pictorial representation. Getting Franz Schubert a good education at the Akademisches Gymnasium with board in the Stadtkonvikt, all paid for by the Emperor, was a careful and ingenious plan of his father's that took time and effort. It succeeded. A reconstruction of the life of Johann Senn, Schubert's great friend from the Stadtkonvikt. An independently-minded thinker, an intellectual rowdy, a man of principle who disdained money – just the sort of person to interest the secret police in those nervous times. The loss to the Schubert circle following his arrest and deportation was incalculable. —Life and literary failure after the army. An analysis of Graf Friedrich Leopold zu Stolberg-Stolberg's poem Lied auf dem Wasser zu singen, für meine Agnes, first published 1783, set to music by Schubert in 1823 as Auf dem Wasser zu singen, 'To be sung on the water', Op. 72, D 774. This poem is one of the few that Schubert set that was worthy of his genius. A selection of Schubert's works that is intended to help a person unfamiliar with them to get started. It is not comprehensive – much excellent and beautiful music is not on the list – just an attempt to help answer the question that faces all classical music listeners at some time or other: where do I start? The complex and uncertain history of the text of Goethe's Heidenröslein, brilliantly set to music by Franz Schubert (D 257), including a close analyis of the text. The poem has entered the German psyche, but is also remembered for settings by other composers in the tradition of the Volkslied. The complex and uncertain history of Symphony No. 7 (or No. 8), D 759, the Unfinished Symphony. Was it unfinished, unfinishable, forgotten or did it require no further finish? The assessment of Schubert's suitability for the life of a soldier as recorded in the registration and conscription sheet for the Schubert family on their move to the new school in Rossau. Fortunately, Franz was not cut out for the job, as was apparent at the first glance. Franz Schubert's acclaimed setting of Ave Maria. Yet one more great hit that became popular only after his death. Spiritual feelings from the anti-clerical composer that even surprised his father. Exploring the famous 'ink-blot' autograph of Schubert's Die Forelle, 'The Trout' – as well as the many other autographs extant. Franz Schubert's only public concert, on 26 March 1828. A success that even generated some income, despite competition from Paganini's concert series, but which was never held again. The mysterious excursion to the Monastery of Heiligenkreuz to play Ignaz Kober's famous organ there. Schubert composed a four-handed fugue for the occasion. 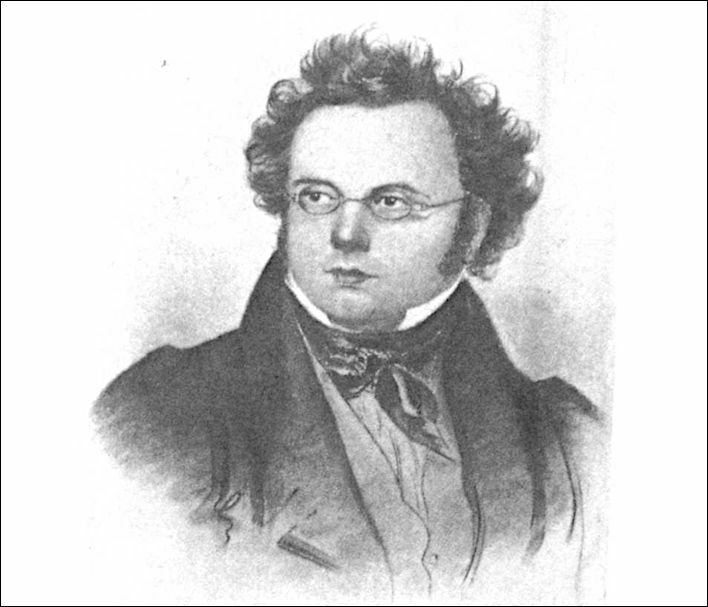 Schubert's perceived deficits in fugal composition and his efforts to remedy them. An investigation into Franz Schubert's first stay as music master for the Esterházy de Galántha family at their country house in Zseliz in Hungary in the summer and autumn of 1818. It was a youthful travel adventure with a holiday romance thrown in, but in the end he was glad to get back to his beloved Vienna. Schubert's syphilis infection. It appeared at the beginning of 1823 and caused him two years' distress of varying intensity. He was unlucky: the disease appears to have dogged and depressed him until the end of his life, but despite that it never really brought the Schubert composing machine to a standstill. Schubert's second stay with the Esterházy family in Zseliz in the summer and autumn of 1824. A break from the bleakness of life in Vienna, where so many of his friends were absent. The mystery of the relationship between Schubert and Countess Caroline, unsolved to this day, despite new details of her brief and unsuccessful marriage. Schubert's alleged unrequited passion for Augusta Grünwedel; many questions, few answers. Did he really order a certificate of baptism in 1827? If so, why? And if he had really proposed marriage to someone, who was it? A late and not altogether serious review of Professor Julian Horton's 2015 book Schubert, a book suitable only for holders of gold and platinum credit cards. A partial investigation into the suggestions that there was endemic homosexuality or bisexuality among Schubert and the other members of the circles of friends. The article looks firstly at the history of the concept of homosexuality in German speaking countries; secondly, the reaction to homosexual behaviour in Biedermeier times as presented in the 'Poets' War' between Heinrich Heine and August von Platen; and thirdly some aspects of Biedermeier life and the culture of Empfindsamkeit that might be mistakenly interpreted as homosexual behaviour. An examination of the chronology of the four months leading up to Franz Schubert's death on 19 November 1828 as well as the medical assessment of Schubert's general ill-health and the immediate cause of death, typhoid fever. An analysis of Johann Friedrich Rochlitz's poem Alinde and Schubert's remarkable musical setting of it. The poem marks the transition from fixed Classical metrical forms to flexible speech forms and Schubert responded masterfully to the complex challenge of setting it to music. An analysis of Friedrich Rückert's poem Daß der Ostwind Düfte, which Schubert set as Dass sie hier gewesen. The poem is a tour de force interpretation of the poetry of the medieval Persian writer, Hafez. Both the language and symbolism of the poem demand careful reading and consideration. Revisiting Wilhelm Müller's poem Die Nebensonnen, poem 23 in the Winterreise song cycle. Is the optical phenomenon of very cold winters, 'sun dogs', the factual basis for Müller's imagery in the poem? Here is a list of links to other websites having a Schubert theme. The list is in alphabetical order of the website name. We would like to develop this list interactively, which is an affected way of saying that those who want one or more websites listed here should email us. Submit your own short description, or leave it to us to make something up. Die Winterreise. A modern and visually interesting site covering all things Winterreise, with a strong musical basis (discography etc.). The LiederNet Archive. A long established and very extensive documentation of (currently) over 150,000 Lieder, among which the Schubert Lieder are, of course, well represented. Michael Lorenz. Some Schubert, but many other pieces on other musicological topics. The website has come to a standstill since Dr Lorenz somewhat tardily realised that his work on his blog would always remain unpaid. The Schubert Institute (UK). The website is dated, out-of-date and poorly maintained; the archive of The Schubertian, the journal of the Institute, is simply left blank. Schubertlied. An extremely ambitious attempt to document and perform the Schubert Lieder. Some background information about the image we use as the thumbnail for our Schubert articles. We believe that this is the most realistic image of the composer. Schubert's head and shoulder portrait, drawn on paper (17x13 cm) was acquired in 1900 for the collection of Prince Liechtenstein. Nothing is known of the provenance of the picture before that. Some time before 1956 it turned up in the Sankt Lukas gallery in Vienna, owned at the time by Robert Herzig. Today the portrait is in private hands in the south of France. How Lieder's Schubert portrait came into being is unknown. It does not seem to have been created as a preliminary for a lithograph, but rather to have been intended as a sketch for the portrait (formerly ascribed to Teltscher) that was once in Zseliz and which is now was in the possession of Franz Albrecht Metternich-Sändor [1920-2009]. This portrait – in coloured pencil, wash and with red emphasis (20 x 16 cm) – is of the highest artistic quality. Although not signed, it was probably coloured by Lieder himself. Based on the date of the preliminary sketch this portrait must also date from around 1827. Schuberts Brustbild, auf Papier mit den Maßen 17x13 cm gezeichnet, wurde um 1900 für die Sammlung des Fürsten Liechtenstein erworben. Uber die frühere Provenienz dieses Bildes ist nichts bekannt. Vor 1956 kam es in die Galerie Sankt Lukas in Wien, deren Besitzer damals Robert Herzig war. Heute befindet sich das Porträt in Privatbesitz in Süd-Frankreich. Wie Lieders Schubert-Porträt zustandekam, ist ungewiß. Anscheinend war es nicht als Vorlage für eine Lithographie bestimmt. Es entstand eher als Vorzeichung für das (ehemals „Teltscher?“ zugeschriebene) Porträt, das einst in Zseliz war und sich jetzt im Besitz von Franz Albrecht Metternich-Sändor befindet (siehe Abb. 2).16 Dieses Porträt - eine Farbstiftzeichnung, gewischt und rot gehöht (mit den Maßen 20 x 16 cm) - ist von höchster künstlerischer Qualität. Obwohl nicht signiert, wurde es wahrscheinlich von Lieder selbst farbig gemalt. Folgt man dem Datum auf der Vorzeichnung, so ist für dieses vollendete Porträt als Entstehungsjahr gleichfalls 1827 anzusetzen. Steblin, Rita. 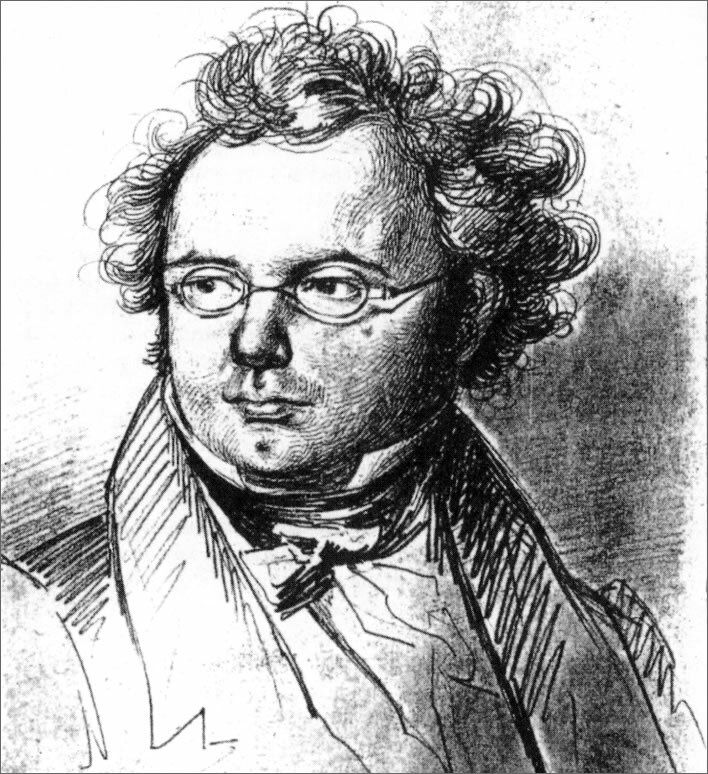 'Friedrich Lieders Schubert-Porträt von 1827' in Schubert durch die Brille vol 12, 1994, p. 93-99, p. 93/4.